Rockford™ manufactures steel building systems with pride, and commitment to traditional American Quality. They have kept true to their commitment by designing and purchasing the most advanced technology in machinery and computer aided manufacturing equipment. Rockford’s State of the Art Factory in Walterboro, South Carolina is one of the most modern and innovative of its kind. Their investment in computerized engineering and manufacturing enables them to produce as many as 20 buildings per day. The products manufactured by Rockford Steel Building Systems are all available from Andree Builders, Inc.
Rockford's™ Custom Buildings are available with a full complement of standard and optional components and features. Let us help you choose from Rockford specifications to design most any building from the most economical utility building to a commercial showplace, or industrial complex of unlimited size. Roof Panels: Custom building alternative: standard seam roof system. Various other gauges available upon request. Visit Rockford Steel Building's website. 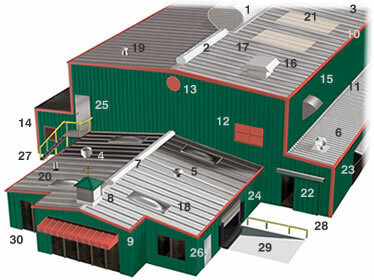 Contact Us today to learn more about Rockford Steel Buildings!